Absolutely sumptuous stuff from a producer who never seems to receive his just accord – and one of THE few releases with the word 'jazz' in the title which actually warrants the epithet. Each of the tunes unfolds organically, rolling out in surprising ways over rhythmic vistas which remain rock solid, but shift imperceptibly. The 'dream topping' is consistently innovative – frosted wisps of vocal over warmly enveloping chords – and even the rude funk bassline propelling sections of 'Raindrops' fits like a metallic claw in a velvet glove. A ridiculously flavoursome release which places Chris right up there with the masterful likes of Endemic Void, for me. Class release from an absolutely underrated producer. Chill yet dancefloor-friendly, impeccable programming. 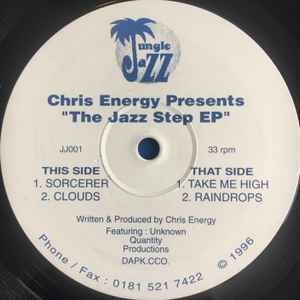 Wonderful downtempo/acid jazz track on B1 as well... so many excellent, obscure releases that suffered from lack of distribution/marketing and a flooded market for drum & bass in the '95-97 era.